In a large pot, add water, chicken and half of the gallant soldier weeds. Let simmer for approximately 40 minutes. Once chicken is cooked, place on plate, cut in small chunks, and cover with aluminum foil to keep the chicken warm. Do not toss the water. Then, in the same water you cooked the chicken, add the two kinds of potatoes, onion and garlic. Let cook for approximately 2 hours for potatoes to dissolve completely. Add the chicken chunks, ears of corn, chicken broth, green peas and salt to taste. Mix carefully with all the ingredients, and let simmer for another hour over low heat. Add the other half of the guascas and cook for 5 more minutes. If desired, you can add a third type of potato, like red. The most important thing about this soup is cooking at low heat, so all ingredients can hold the unique flavor ajiaco brings. The chicken can either be served as whole pieces or in chunks depending on your preference. It goes well with capers, white rice and ripe avocado. Heavy cream is also a perfect side dish for this recipe. What a delicious memory! At home, the word ajiaco (potato and chicken stew) was always accompanied by a party, friends, cousins and uncles coming over; and with lots, and lots of flavor. From the very first moment the pot was placed on the stove, the majestic aroma of the guascas (gallant soldier weeds), the indispensable ingredient needed to prepare a delicious Ajiaco Colombiano, would fill the house. 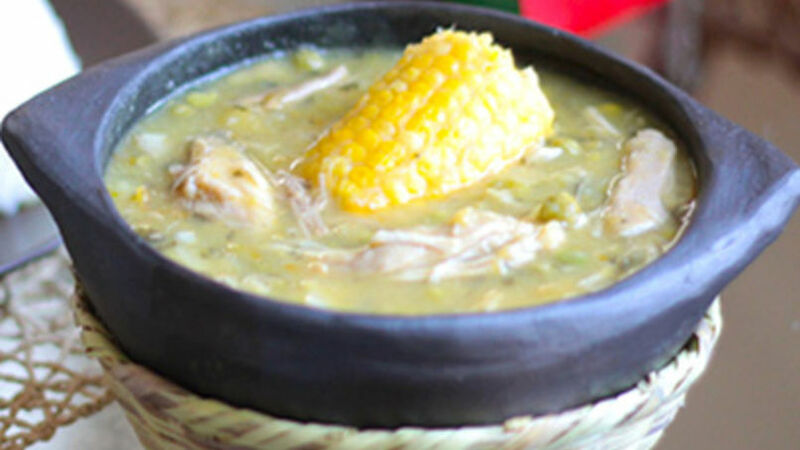 Ajiaco is one of the staples of traditional Colombian cuisine; it’s also the famous weekend soup. However, it is customary to prepare large portions of this soup for family gatherings and different occasions. Here I invite you to delight yourself by making this delicious recipe. Enjoy it with your family!